Second half goals from Luke Murphy and Sam Byram earned Leeds United a massive away win at Reading’s Madejski Stadium. The 2-0 success saw the Whites climb up to 17th place in the Sky Bet Championship and the value of the victory was emphasised as third from bottom Millwall - United’s next opponents on Saturday - also won away at Birmingham to stay five points behind Neil Redfearn’s men. 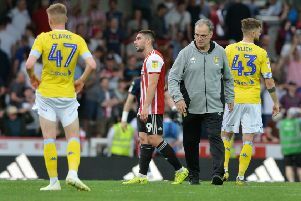 The Leeds side showed three changes from the one that narrowly lost to Brentford on Saturday with Giuseppe Bellusci returning from suspension in place of the ill Liam Cooper, Tommaso Bianchi back in for another ill player, Rudy Austin and Alex Mowatt preferred to Billy Sharp as the formation was changed from 4-4-2 to 4-2-3-1. Sol Bamba was made captain in only his third game for the club and kept the back four well organised in the opening half. Although the game was played at a high tempo chances proved few and far between initially. Leeds did get a shot on target when Bianchi’s effort was comfortably saved by Adam Federici following a corner won by a good move involving Lewis Cook and Steve Morison. Bianchi then limped off on 29 minutes after a collision with Danny Williams, to be replaced by Casper Sloth. Bellusci made a good block after Nick Blackman threatened for Reading and Alex Pearce headed over from the resulting corner. Blackman fired an effort wide before Leeds finally created a good opportunity, young midfielders Mowatt and Cook breaking forward well to supply Morison, who made space only to see his shot hit the post. At the other end, Williams brought Marco Silvestri into the action with the keeper saving his shot and the half ended goalless. In the second half Reading had the first sight of goal when Michael Hector’s near post flick on from a corner was blocked on the line. But United remained resilient and it was they who broke the deadlock just past the hour mark when midfielder Luke Murphy beat Federici with a strike from about 25 yards out for his third goal in five matches. Leeds then looked to kill off the game, but Morison and Sam Byram both shot over. Reading threw on strikers Yakubu and Simon Cox as they desperately tried to hit back and Silvestri had to make a good save with his feet to deny Williams. Jamie Mackie fired wide from distance and Yakubu was off target from closer range as Reading continued to pile forward. Yakubu then sent a header wide, but Leeds looked dangerous on the break and after a penalty shout for a possible foul on Charlie Taylor was waved away they came up with a crucial second goal. Murphy put Morison through inside the area and although his shot was saved he was able to cross the ball for Byram to net with an easy header. United could have had a third in injury-time as Sloth met Byram’s cross, but his effort was blocked. However, they had done more than enough to earn a crucial victory and were delighted to make it back to back away wins for the first time this season. Reading: Federici, Kelly, Pearce, Williams, Hector, Norwood (Mackie 63), Chalobah, McCleary, Obita, Blackman (Yakubu 70), Pogrebnyak (Cox 70). Leeds: Silvestri, Wootton, Bamba, Bellusci, C Taylor, Byram, Murphy, Cook, Bianchi (Sloth 29), Mowatt, Morison.